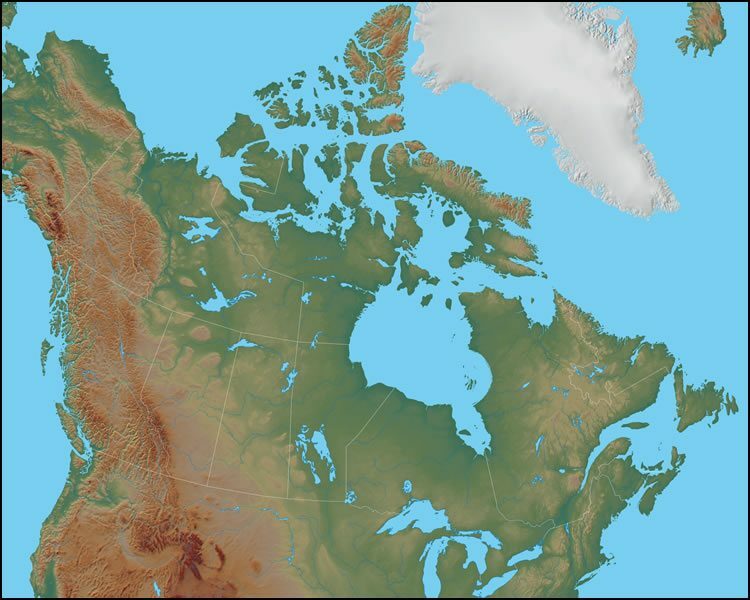 The map above reveals the physical landscape of Canada. The Torngat Mountains mark the boundary between Quebec and Newfoundland & Labrador. Yukon Territory has the British Mountains, Richardson Mountains, Ogilvie Mountains and Selwyn Mountains. The Mackenzie Mountains are in western Northwest Territories. British Columbia has the Coast Mountains. And, the Rocky Mountain Range passes through Alberta and British Columbia. There are many major lakes in Canada in addition to the Great Lakes. Great Bear Lake and Great Slave Lake are in the Northwest Territories, Lake Athabasca spans the border between Saskatchewan and Alberta. Reindeer Lake is along the border between Manitoba and Saskatchewan. Lake Winnipeg, Lake Winnipegosis and Lake Manitoba are in Manitoba. Lake Nipigon is in Ontario and Quebec has Lac Mistassini and Lac St. Jean. Important coastal bodies of water are the Gulf of St. Lawrence, Labrador Sea, Hudson Bay, Davis Straight, Baffin Bay, Parry Channel, Beaufort Sea, Arctic Ocean and Atlantic Ocean.